When we look at the causes of Basal Cell Carcinoma there seems to be alot of conflicting information. For example, the sun's UV radiation seems to be the prime suspect, but then when researching the subject we can see that a person's genetic makeup, petro chemicals, and arsenic, all play a part in whether a person is likely to get basal cell carcinoma or not. The purpose of this page is to look at each of these potential causes, explain what they are, and how they might increase the risk of having basal cell carcinoma. Ultraviolet (UV) light rays are a form of invisible radiation that comes from the sun, sun tanning beds, and sun lamps. Ultraviolet rays may go through and change skin cells which is one of the causes of basal cell carcinoma. Ultraviolet A (UVA), is the most common kind of light that reaches the earth's surface, and reaches into and below the top layer of skin and scientists believe that UVA rays can damage tissue and increase a person's risk of basal cell carcinoma. Ultraviolet B (UVB), light is absorbed by the ozone layer, and because of this are less common on the surface of the Earth than UVA rays. UVB rays don't penetrate as far into the skin as UVA rays, but they can still be damage the skin's cells. Ultraviolet C (UVC), rays are the most dangerous, but they are absorbed by the ozone layer and do not reach the ground. So, as Ultraviolet C (UVC) do not reach the surface of the Earth we should look more closely at UVA and UVB rays. UVA rays makeup about 95% of the UV radiation hitting the surface of the Earth. Although they don't have the same intensity as UVB rays, UVA rays do have the same intensity during daylight hours throughout the year and can pass through clouds and glass. UVA penetrates the skin's layers more deeply than UVB and passes right through to the layers of basal cells. Studies have shown that UVA rays contribute to and might even start the development of basal cell carcinoma. It is the UVA that is the primary tanning light and it is known that whether the source of UVA is natural sunlight or artificial tanning beds, it can cause basal cell carcinoma. A tan is the skin's attempt to protect itself from the damaging UVA rays, so while you think a tan might look healthy it is actually a sign that the skin is actually being damaged. UVB rays are the rays that cause sunburn and damge the surface layers of skin, and are one of the primary causes of basal cell carcinoma and other skin cancers and premature skin ageing (wrinkles etc) The intensity of UVB rays depends on where you are, for example at high altitude, what season it is, and what time of day it is. For example, if you are near the equator at high altitude at midday, you will receive a much higher dosage of UVB radiation than if you were in a more southerly (or northerly) lattitude in the morning or evening. You should also remember that snow can reflect 80% of UVB rays so wearing sunblock is just as important in colder climates as in hotter climates, on the other hand UVB rays do not penetrate glass very much. Ultraviolet A & B rays cause skin cancers like basal cell carcinoma. These rays come from the sun and from tanning beds. 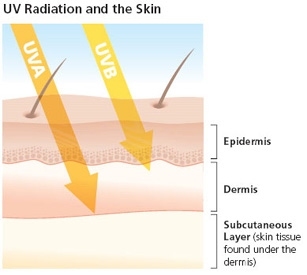 Ultraviolet C rays do not cause skin cancers because they do not reach the surface of the Earth. Ultraviolet A, B & C rays are also produced by Arc welding and can cause skin cancers like basal cell carcinoma. The best way to protect yourself from ultraviolet A & B rays is by wearing a hat, long sleeved clothes, and long trousers. On skin that is exposed to the sun, use a sunblock with a mimimum SPF (Sun Protection Factor) of at least 15 and don't use artificial tanning beds. Arsenic (found in some pesticides), paraffin, tar, coal and some types of oil also possibly one of the causes of basal cell carcinoma. Of these arsenic seems to be the most likely cause. For years arsenic was (and in some cases still is) used as a pesticide, it is also found in ground water.